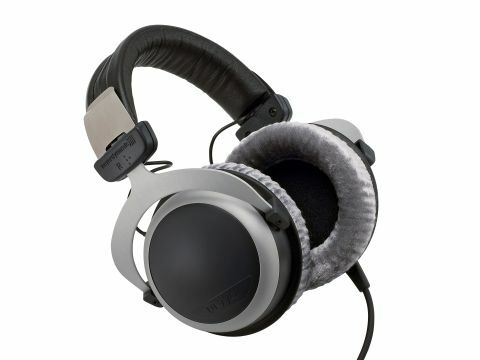 Closed-back headphones are rare in the serious hi-fi world. On the whole, it seems, those listening in private prefer not to be cut off from the outside world. And besides, closed-back cans have a reputation for a more 'boxed-in' sound than the open-back variety. Still, there are often advantages to a degree of acoustic isolation (both ways!) and it's often put about that the bass of closed-back designs is superior. Beyer includes both types in its range. The DT770 name in fact goes back a long way, though this is a new design, sharing many features with current open types including the range-topping DT990. It sports wide-range drivers of high impedance, which will be easily driven by any headphone output, though we certainly appreciated the luxury of a dedicated headphone amplifier through Beyer's offering. As closed headphones go, the DT770 offers relatively modest exclusion of the world outside and we reckon Beyer has struck a happy balance here, allowing the listener to hear the telephone, for instance, but distinctly dulling the general background noise of the world. Comfort scores highly and the long, highly flexible cable is reasonably unintrusive.